When I “raided the fridge” recently I came up with this cauliflower and halloumi salad recipe. It’s now become a staple. Do you raid the fridge? And no, I’m not talking about midnight snacks! I love raiding the fridge to get rid of ingredients that might be nearing their use by date. It allows you to get creative and ignore any rules when it comes to cooking. It’s just you and your imagination. And my imagination let me create this wonderful cauliflower and halloumi salad. As always, I have halloumi cheese in the fridge. This cheese is so versatile you can do anything with it! Toss it with chargrilled zucchini for a lovely summer salad. Stack it on top of in season heirloom tomatoes. And even combine it with quinoa to make a very “hip” version of keftedes! My preferred method of cooking cauliflower is roasting. However in this case I grated it and made a version of “cauliflower couscous” or “cauls-rice”. It was tossed with some leftover kale and garlic. I added a little sumac for “zing” and a few pistachios and dried cranberries for texture. And whilst warm I dressed it in a pomegranate molasses dressing. Finally I crowned it with just pan fried halloumi slices. Absolutley gorgeous! Another successful fridge raid I say! 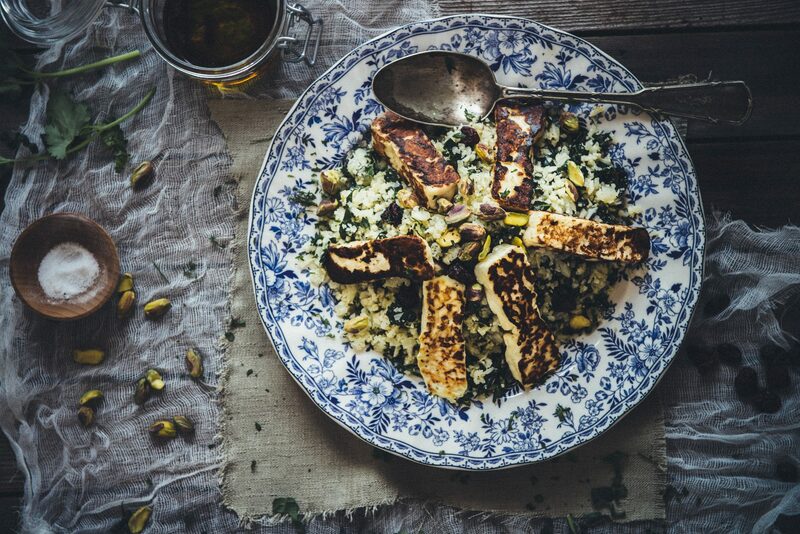 Scroll down for the cauliflower and halloumi salad recipe. Using a little creativity and leftover fridge ingredients I made this cauliflower and halloumi salad. It's quite easy to put together and it's even better when you add your own touches to it. Place 2 tbsp of olive oil in a pan over a medium sized heat. Add the grated cauliflower, garlic and greens and sauté for 5 mins until cauliflower is cooked through and greens are wilted. Transfer to a bowl. Add the pistachios, dried cranberries and sumac. Toss until well combined. Clean the pan and heat on a medium high heat with a little oil. Fry the halloumi “fingers” for 2 min each side until golden brown. Once cooked set aside. Combine the dressing ingredients and pour over cauliflower salad. Top with the fried halloumi and garnish with freshly chopped coriander. I have provided a rough guide with these ingredients. When you’re playing with food in this relaxed manner it’s fun to add your own twist to things. If you like something, add it. If you don’t then that’s good too.